Each of the game's 10 guns has two unique modes. Marvelous has shared new information and screenshots of Senran Kagura: Peach Beach Splash introducing each water gun type’s two modes, the “Drenched Power-Up,” and the in-game store. All 10 types of water guns each have two modes. Each mode differs in power and effect, so switch between modes depending on the situation to proceed the water gun battle more efficiently. A full-auto shooting type water gun capable of continuously firing water bullets. While its power is not that high, it is unmatched in ease of use. Continuously fires water bullets for as long as you press the button, so if you hit the opponent you won’t give them a chance to retaliate, but if you miss, you’ll lose out on a great amount of water. Fires only three shots at a single time, but because it is more powerful than Full-Auto Firing, it consumes less of the water gauge when successfully aimed. A water gun that fires several water bullets with a single shot. The power decreases depending on the range of the shot, and the water bullets that fire scatter. Can deal damage to a vast range of enemies at a single time. Compared to Homing Scattering Bullets, its range is shorter, but its power is greater. Several bullets automatically follow your opponent. Its power is low, but since it follows the enemy, its hit rate is high. A water gun that fires water balloon grenades. The water balloon that fires will explode when it hits an enemy or terrain. Water balloons will rebound as they hit objects, so you can deal damage to enemies hiding in the distance by skillfully using objects such as walls. It is also high in power. A short distance mode where water balloons do not rebound as they hit objects, and will instead explode in the place they land. The exploding water will also damage enemies behind walls. A water gun that fires water bottle rockets. Its linear attacks are top class, but its reload time is long. A quick, high-power single shot. It can blow away several enemies at once when they’re all crowded together. Fires three missiles with a single shot, which follow the enemy, but move slowly. Compared to High Speed Linear Missiles, its power is also inferior. Shoots a long-range water laser. Consumes a lot of the water gauge, but the water laser possesses the powerful ability to penetrate your opponent. Its lock-on range is a somewhat narrow, but it is the most powerful of the water guns. If you can successfully lock-on to the opponent, you’ll inevitably deal major damage. Its lock-on range is wide, allowing you snipe at faraway enemies, but compared to Power Specialization, its power is halved. The amount of the water gauge consumed while shooting is low. Furthermore, you can shoot your opponent while hidden since it ricochets. Compared to the automatic Full Burst Firing, setting your aim is necessary, but you can prevent against wasteful shooting. Fires at high speeds. Since you can continue shooting until you run out of bullets, you should be careful as it is easy to waste water and be caught off guard. Single shot water pistols so you can fire two shots at once. The amount of the water gauge consumed while shooting is low. Auto-aim has a wide range. While it doesn’t have many bullets loaded, it is high in power. By accurately aiming and shooting, you can deal great damage. It has many bullets loaded, but is lower in power than the Power Specialization. You can overwhelm the enemy with consecutive attacks. A weapon that continually shoots water as you hold the trigger. Damage will continually be inflicted but it consumes a lot of the water gauge. Its range is low, but it can consecutively deal damage to nearby enemies at once. It creates a mist when it shoots that damages the enemies inside it. It has various methods of use, such as inviting enemies with Emission Type and then trapping them with Stationary Type. 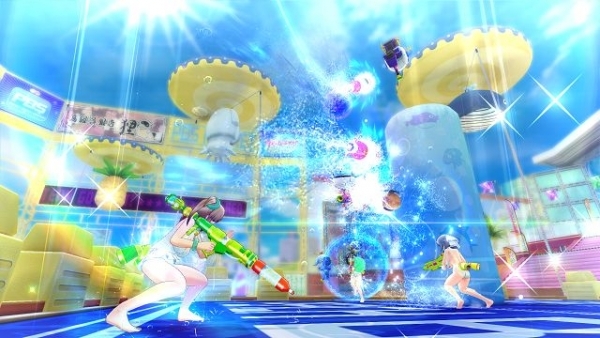 A spin-up-type water gun with a gradually increasing firing speed. Its power is more than enough to make up for its damper on mobility. It is lower in power than the Poewr Specialization, but has a higher amount of loaded bullets that doesn’t give the enemy a chance. It is higher in power, but has half the amount of loaded bullets offered by the Loaded Bullets Specialization. A water gun that sprays water as a mist. You can continually shoot and cause constant damage, but the range is extremely short. Since its trajectory is linear, it is easy to target a specific enemy. It is lower in power than the Scattering Type, but has many loaded bullets, so it doesn’t give the enemy a chance. Since it spreads water across a vast range, it can hit a number of enemies, and settles considerably easily even when running from place to place, making it easy to deal damage. When the girls become soaking wet from their opponents’ attacks and their allies’ attacks, a “Drenched Power-Up” will activate. When activated, you’ll have an inexhaustible supply of water that doesn’t deplete for a fixed period of time, allowing you to pound away at the water gun. In addition to standard items like card packs, costumes, hairdos, and accessories, you can also buy Rubber Duckies that change the colors of your Kunekune Finishes and Touching water. Additionally, you can buy avatar icons, panel skins, game system voices, illustrations, videos to view, and stamps to use in Multi-Splash. You can change the store salesperson to your favorite character. Senran Kagura: Peach Beach Splash is due out for PlayStation 4 in Japan on March 16 in multiple editions. A western and Asian release is also planned.